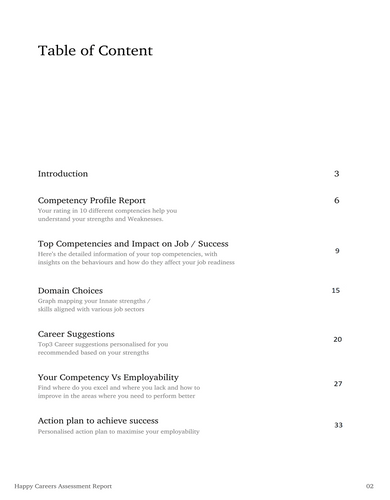 nSmiles' career guidance tests helps discover your innate strengths, interests, competences and employability skills. 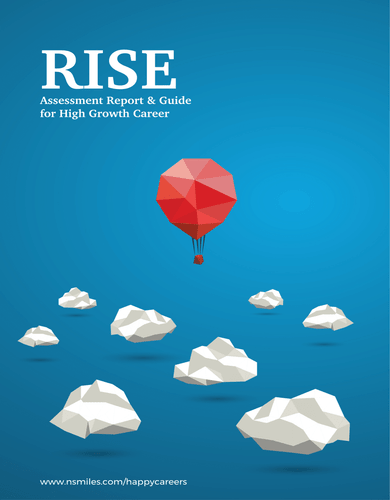 Get your career guidance report to fast-track your career readiness. Finding your high growth career is easy. Our proven approach below has helped Lakhs of students and freshers discover their personal high growth career. Finding ones innate strengths & interests and mapping these to latest market opportunities. From these opportunities we pick top 3 high growth careers for you and present your current competencies & career readiness with respect to the same. A personalised plan to bridge the gap in these competencies faster by leveraging your learning styles. Ex: Student Raja, is a 2nd year engineering student in tier-II college. Now he has taken this assessment What are his key leanings: Top 3 career domains, core competency in green to red, green representing the strengths, red needing immediate attention and action plan to get academic and career success. Build on strengths – Asses Interests, Competencies and self-management skills to plan a career in the area of specialisation or alternate areas based on personal preferences. 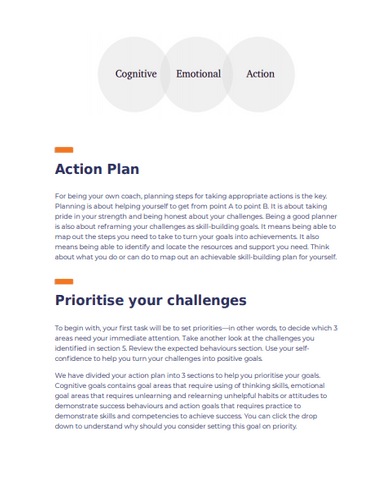 Learner focused - Understand the key competencies and self – management skills that actually support the achievement of top performance in academics and career development. 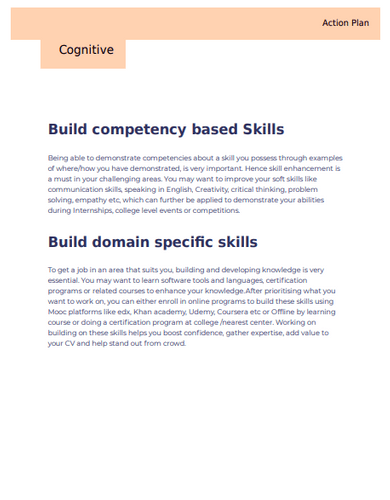 Targeted skills knowledge – Gain the skills and knowledge required to excel at a job role. "Very highly informational. 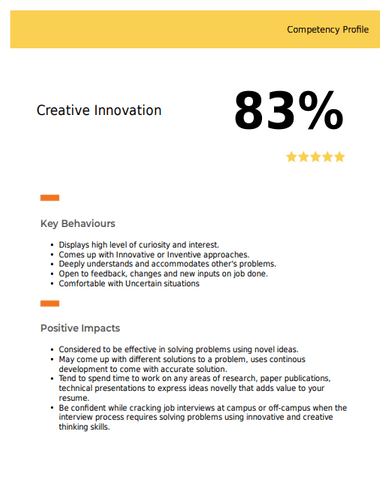 First thoughts are that the report itself is awesome. Provides a very in depth analysis. 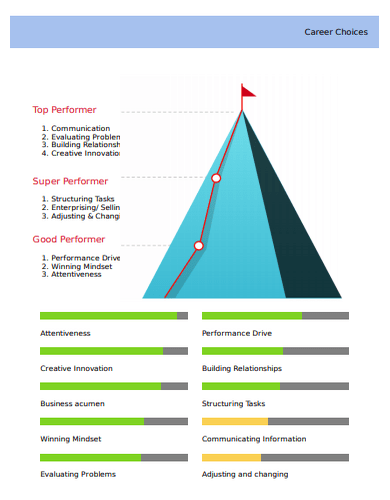 Enjoyed reading it and trying to identify which areas need improvement." "I have always been good at academics but speaking, socialising and making friends don’t come naturally to me. 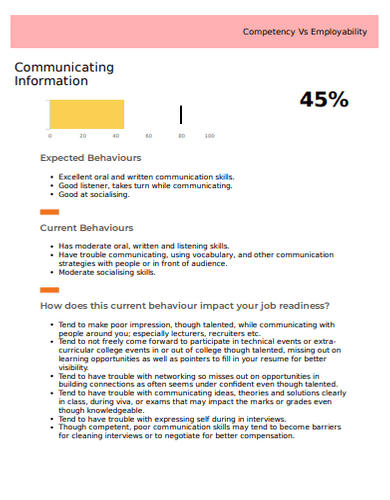 Taking this assessment helped me understand the root cause, after counselling am trying to speak, communicate and accept people"
"The program helped me choose right branch in my MBA and helped me understand what does it takes for me to be confident during placement interviews. I am currently working on the skills I lack." 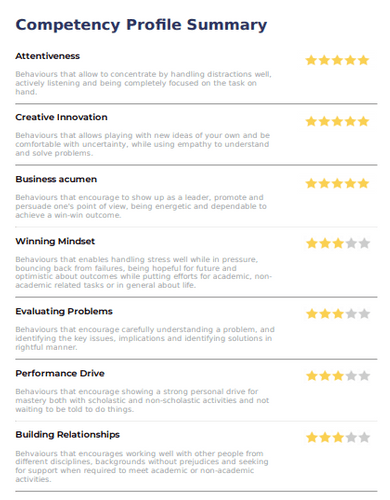 "This assessment is great. I was confused with my career choice. I am a topper but highly anxious on what would I do with my career post engineering. I didn’t express to anyone but internally I was very sad and worried. Post taking the assessment and counselling, I not only got clarity on my career path but also got access on how to build in the areas I loved working."